The Governor and Mrs. Fergusson participated in the annual picking of Easter Lilies for Her Majesty The Queen. 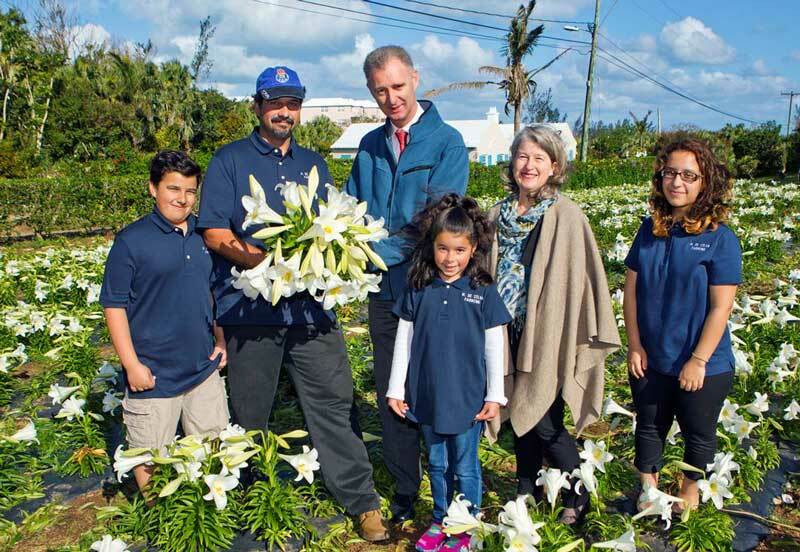 This year’s Easter Lilies were grown by Manuel DeSilva, who is pictured below along with his children, Tiffany, Joshua and Catrina. A great tradition that I hope will continue. You can kiss Bermuda by if we go indepedent…that’s to all you jokers out there who really believe in that. The queen doesn’t do anything for me either but in reality we would go down the toilet fast! ‘Build’ are you kidding? What a bunch of propaganda…you’re comparing apples and oranges. Exactly what does Britain do for us and how would we be any worse off without them. I assume that as an adult you’re still living at home under the watchful eye of your mum, huh? Scared to go off and make your own way in the world without mum hovering in the background to catch you if you fall? I’ll bet back in 1776 there were people exactly like you over in the United States preaching all the perils of going independent and sowing fear everywhere over how it would all go wrong and we see what a catastrophe THAT was, right? Conversely…how do they hurt us? Thankfully an even larger percentage of Bermudians understand this. Very true @Terry. Nothing like sending some beautiful Easter Lillies to the head representative of the people who Colonized us and most of the world through force! I hope she enjoys them..
You obviously do not know your history. She wasn’t even born when colonization took place. More countries have gone independent under her reign. I know my history quite well. Perhaps you should learn to read, I never said she was born during colonialism. She remains the head of the commonwealth, and her ancestors were quite involved in colonialism. You think her family got their land and wealth through hard work @BDA Student? That goes for the Oligarchy too, they’re part of the lineage. Your oligarchy too, don’t leave them out. Oh. So I guess that gets her off the hook. Better than being “Colonized” by uninformed people like you. Look before you put words out there. Like how they speak Portuguese and French in Africa. In some countries they do ya dumb***! I highly doubt the Queen enjoys them. She’s been getting flowers almost every day for eighty plus years. I’m sure if she never saw another flower it would be too soon. She’ll say “How nice” and then place them with all the tons of other flowers and gifts she receives but doesn’t need. i hope this tradition continues for all future monarchs. Let be clear, the British settled in an empty Bermuda and made it a colony. The British did not come here, find people, take over then make it into a colony. Therefore, they did not ‘colonize’ us in the way most haters of British would want you to believe. Many people came to Bermuda in search of opportunities that the British provided. So please dismiss the notion that the British forced themselves onto us and our culture. Mocking Jay is the biggest lily out there! If i may….if ssomeone was to recieve our beautiful lillies….i would say only that they pall to the beauty of their percieved recipient…i would if given the opportunity emplore gardens of Buckingham to …when the lillies bloom and receed…to take the bulb and break it apart …each yellow flake from each bulb will produce another bulb …thereby producing thousannds of lillies…it surely is intended as the gift that keeps on giving!